Oakland is officially under a local state of emergency after the deadly warehouse fire that claimed the lives of 36 people. The city council formally approved the declaration on Thursday, hours before a special forensics team was poised to head to the scene to try to determine its cause. Meanwhile, new questions are being raised about why the so-called Ghost Ship warehouse had not been inspected by the city in decades. Council members said they want answers too. One council member said all the unknowns about inspections came as a surprise. Many artists spoke before the council Thursday, urging its members not to overreact and begin closing other artist spaces because of the deadly fire. Artists and workers who attended the council meeting voiced concerns about other warehouses in the city now coming under new scrutiny. At least one committee member also offered a blunt assessment of the city's code and fire enforcement efforts in light of the 36 people killed inside the Ghost Ship warehouse. "It takes a tragedy for us to react, and us in Oakland we got to get our act together," council member Noel Gallo said. 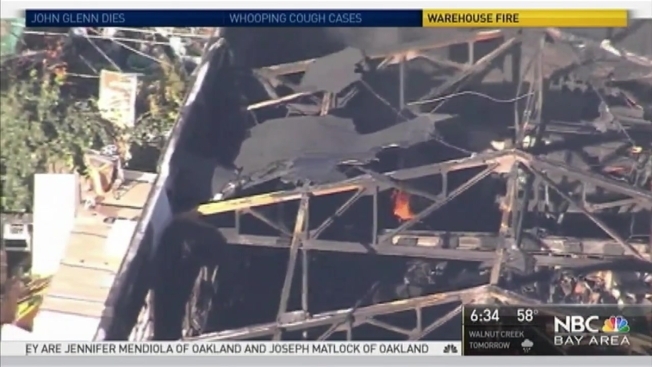 As NBC Bay Area was first to report Wednesday, the warehouse had not been inspected by fire officials for at least a decade and code inspectors had not been inside for 30 years. "I think it is a surprise and at this moment I can't tell you what the scope of it is," council member Lynette McElhaney said. "Is it less than 1 percent of our buildings? Is it less than 5 percent? We don't know. We want to give the administration and public the opportunity to let us know." Some blame years of budget cuts and job vacancies that are slowly being filled. But nobody seems to have a clear answer for why this building was not on the city's radar. "I don't have an answer to that that's why we have to look to see what happened what was missed and what info did we not receive," council member Dan Kalb said. Kalb said he hopes the current investigation will provide answers. Calls to the Oakland Fire Department seeking comment were not immediately returned.